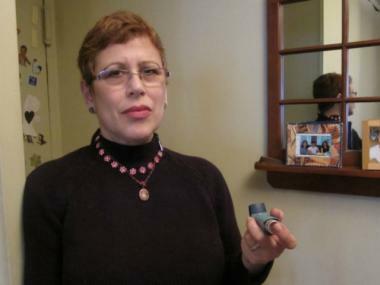 Robin C. K. Plevener believes the return of her asthma was linked to the Second Avenue subway construction. Many Upper East Siders with similar symptoms are dubbing it "the Second Avenue subway cough" or the "Second Avenue subway syndrome." "I've been congested and coughing for a couple of months now," Ebe said. "My ENT doctor said he's been seeing quite a few people suffering from ailments because of the dust. Ebe added, "Whether it's called the 'Second Avenue subway syndrome' or not doesn't matter. The health effects of living near the subway are taking their toll." The MTA will present the findings of its study into health effects at a Community Board 8 Second Avenue Subway Task Force meeting Thursday night. Robin C. K. Plevener blamed the asthma attack that landed her in the hospital four months ago on dust from the Second Avenue subway construction. Plevener, who lives on East 72nd Street and First Avenue — a block from the blasting — developed asthma 13 years ago after having a bronchial infection, but got it "under control" with treatment and was able to stop using medicine for the past seven years. Her illness returned this summer. "I was feeling pressure in my chest, and suddenly one day I just couldn't breathe,” Plevener, 56, said of the October attack that sent her to the hospital. Now she can't breathe well without using her inhaler every 12 hours. "It's definitely the subway," Plevener said. "As soon as the blasting started, I felt a change in the air quality. ... I had to change my walking patterns." Instead of walking on Second Avenue, she now only uses First or Third avenues. "I’m up all night coughing," said Jill, who lives feet from the blasting at Second Avenue and East 72 Street and declined to give her last name for fear of retribution. She was very critical of the MTA’s air quality study, denouncing the agency’s selection of Parsons Brinkerhoff to conduct it. That firm has several ties to the MTA, including as the general engineering consultant on the East Side Access project, she said. "The firm has a direct interest in maintaining a strong, positive relationship with the MTA — their livelihoods and future revenues depend on it," she wrote in a letter posted on the Second Avenue Concerned Citizens Facebook page. "I think everyone agrees that the subway is a great idea," she told DNAinfo. "But the way it’s being handled by the MTA since the beginning has ignored the concerns of the community. … If they don’t follow the rules, there are no repercussions. There’s no oversight." While many residents have applauded recent changes the MTA implemented to cut down on the dust, Jill said the difference has been minimal. The MTA declined to respond for comment, saying it will address concerns at Thursday’s meeting. "I would say there are more people complaining and relating their problems to what they’re perceiving as air quality problems," Dr. Len Horovitz, a top-rated pulmonologist at Lenox Hill Hospital. Not only is his office near the construction, he also lives near the blasting on Second Avenue and East 75th Street and has seen the changes in air quality first hand. Still, it’s hard to tease out the impacts of subway construction versus other construction or possible pollutants in the area, said Horovitz, who'd like to see air monitoring at the site. But he has noticed an influx in patients with chronic sinusitis and post-nasal drip — and not because it's flu season. "There’s a lot more redness, swelling and [clear fluid] that seems chemical, not bacterial or viral," he said. "The cough is not coming from the lungs, but the sinuses. The cough is the body’s response to keeping it out of the lungs." He advises his patients to use Neti pots, devices for rinsing nasal passages, in addition to air filters. "Why get an air filter if you don’t clean the air filter on your face," Horovitz said.